President Uhuru Kenyatta has assured Zimbabwe of Kenya's support to ensure that the sanctions imposed on the southern Africa nation are lifted. President Kenyatta said the sanctions are holding Zimbabwe back, undermining its efforts to effectively serve its citizens. "Imposing sanction is like tying somebody's hands and feet, they cannot move. We will give our support to bring back Zimbabwe to the global platform," said Mr Kenyatta. The President was speaking on Wednesday at State House, Nairobi, when he received a special message from President Emmerson Mnangagwa of Zimbabwe. The message was delivered by President Mnangagwa's special envoy, Air Chief Marshal (Rtd) Perence Shiri. 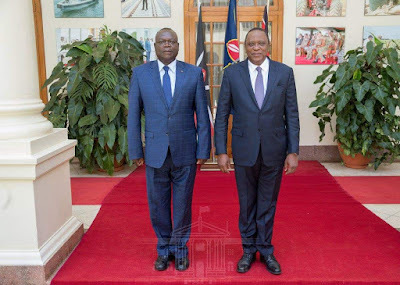 The Zimbabwean special envoy briefed President Kenyatta on the situation in Zimbabwe and called for Kenya's support to get the sanctions lifted. Mr Shiri said the Zimbabwe government was doing everything it could to address the challenges facing their country. He said that plans are underway to ensure that those who lost property during the land reform programme under will be compensated. The "land reform programme led to Zimbabwe's international isolation and sanctions from the US and EU.